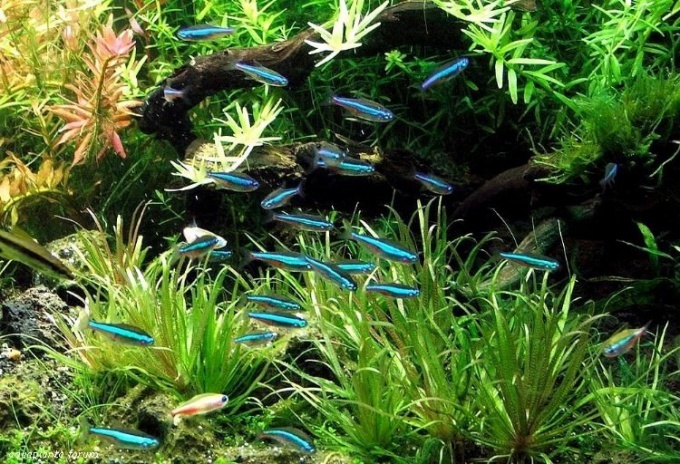 Deciding to buy fish, people often think about what size and shape they need an aquarium. If you want to have your own little world, which will delight the eyes, you can buy a 30-gallon tank. This option is a very good start for beginners. First, this volume gives you the opportunity to place more fish than in small fish tanks. And second, compared to large options, this aquarium won't take up very much space in your room. So we chose the aquarium, now is to determine what fish need to live in a 30 liter tank. This issue should be treated seriously, because the resettlement in the aquarium can lead to disastrous consequences. It is advisable to run a smaller fish, to avoid unnecessary trouble. In the aquarium these volumes is to choose a few small schooling fish or a couple medium, for example, or honey gourami, makropody., apistogramma or pelvicachromis. In addition to fish, you can put a variety of shrimp, crabs and shellfish. 30 liter tank should dwell only small fish, so how big will be uncomfortable to live in such modest volumes. Bettas are a very common species of fish. Males have beautiful fan-shaped fins. Females without them, but they have bright coloration. Required water temperature – 26 degrees. The adult size is 5-6 cm. A very interesting and lively fish. She loves to have an abundance of plants. Unpretentious to the food. Required water temperature – 18-21 degrees. The size of the adult – 2 cm. Quite an interesting fish that live in flocks. Take care of them quite easy. Neons as cardinals, prefer that the aquarium had a lot of plants. Water need soft. The required water temperature is 22-25 degrees. The size of the adult is 4 cm. Beautiful schooling fish that has a bright neon eyes, which gives the aquarium a special look. Fish moving and active. Required water temperature – 20-25 degrees. Completely unpretentious fish species. Males have brightly painted body and a beautiful tail, the females are grey and inconspicuous. Have a high degree of fertility: in a month of acquiring females can be seen 20 fry. To the temperature of the water, they are undemanding. The size of the adult male is 3-4 cm, female 6 cm. Guppies of Sandler is a type of guppy that have not been influenced by selection. These fish are slightly smaller than ordinary guppy: males grow up to 2-3 cm. Very small fish which is perfect for very small aquariums. To water this type of fish is unpretentious. The required water temperature is 22-28 degrees.